Pianoteq 6, resplendent in polished black with its new Steinway & Sons branding, and with most of its extensive sound editing parameters exposed. The user interface is by default quite compact, but scalable. It also changes its backdrop and design depending on what type of instrument you’re playing. Acoustic modelling instruments and plug-ins, which generate sounds from mathematical simulations of real materials, are still relatively thin on the ground, and can sometimes have a bit of a futuristic vibe. So it might come as a surprise, if you haven’t followed its development from the start, that Pianoteq is now 12 years old. 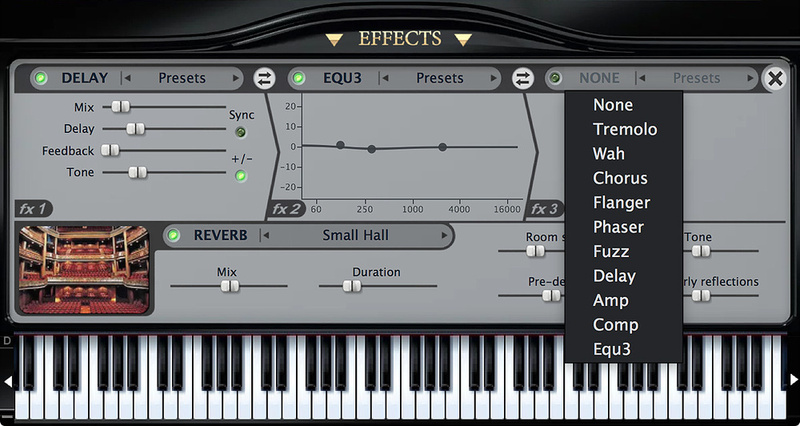 Over its lifetime Pianoteq has improved steadily, from a proof-of-concept CPU-stretching upstart, to a rounded, refined, versatile and (most importantly) great-sounding virtual instrument. Along the way it’s turned its hand to not only acoustic pianos, but also historical fortepianos, Rhodes, Wurlitzer and Hohner electrics, as well as concert harps, steel drums and pitched percussion. And yet its fundamental nature has never changed: it doesn’t use samples at all, has a miniscule installation size (stand-alone and plug-in versions alike are about 50MB), and asks for no more than 256MB RAM. However, as Pianoteq has developed and improved, so has the sample-based opposition. The virtual piano market has never been more hotly contested. What does Pianoteq 6 do that keeps it competitive? Version 6 is improved in three main areas. The underlying physical modelling has been refined, so that even long-standing instruments are said to have better “realism and acoustic presence”. There’s a brand-new tuning section, to support historical temperaments, microtonal setups and more, without users having to get their hands dirty with Scala files. And there’s also now a VST3-format plug-in version, and compatibility with the ARM architecture for Linux users. Additionally, there are some MIDI improvements, including an ‘always on’ event recorder in the stand-alone app. And there’s now the option to export audio files in FLAC or MP3, as well as WAV. For some potential purchasers, though, I expect Pianoteq 6’s biggest draw will be not a feature addition or technical enhancement but an endorsement. This is the first version to be authorised by Steinway & Sons: specifically, the Model D and Model B instruments that already existed in Pianoteq 5. This kind of thing is becoming ever important in the virtual piano world, and actually it is quite a coup to have the blessing of arguably the most iconic piano manufacturer out there. It certainly reflects how far the technology has come, and how seriously it’s taken in the wider piano world. In fact though, Pianoteq wasn’t short of endorsements already: Grotrian and Blüthner had previously approved virtual versions of their pianos. So the package as a whole is looking more authoritative than ever. 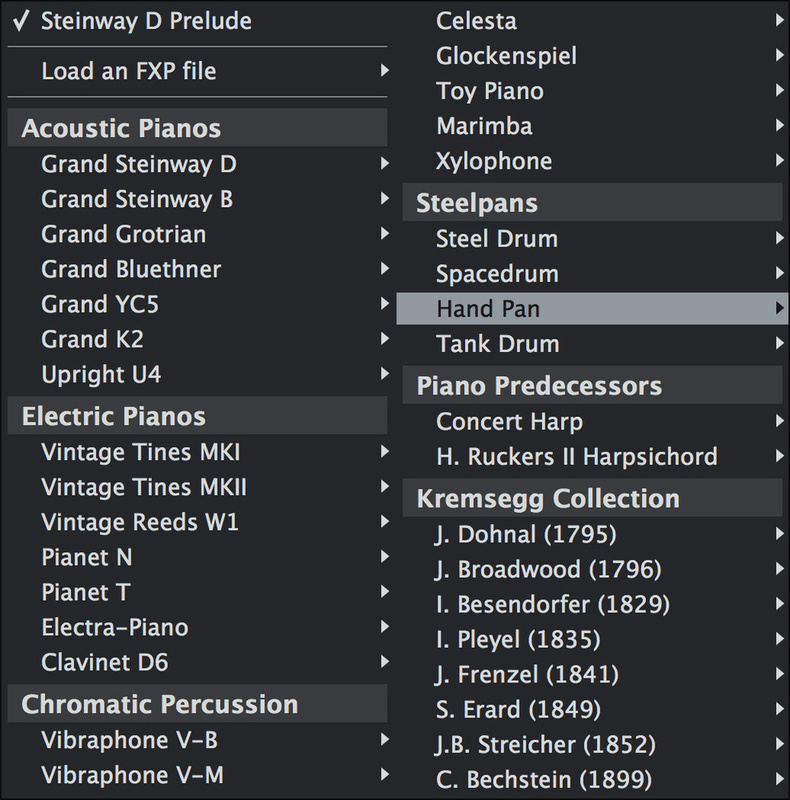 Pianoteq, when maxed out with instrument packs (this one isn’t quite...), is a potent thing, covering a lot of sonic ground.Here’s a quick overview of how you acquire and equip Pianoteq, before we look more closely at the new features. 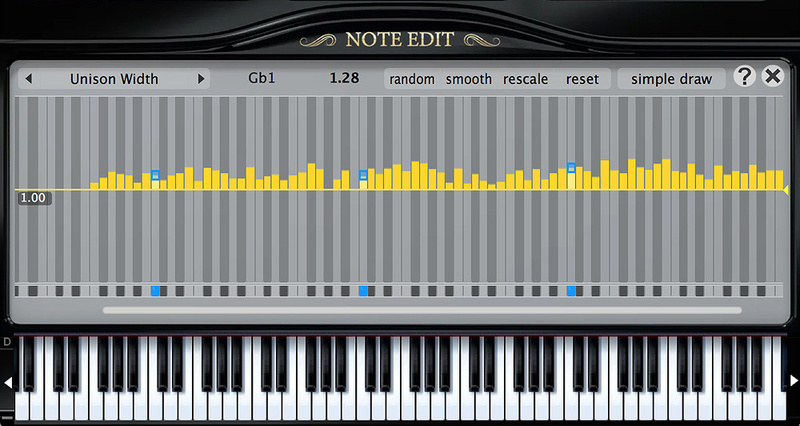 It runs as a stand-alone application and VST, AU or AAX plug-in, in Mac OS, Windows and Linux. That’s true for all three versions of the product, which are Stage (€99), Standard (€249), Pro (€399) and Studio (€699). They all sound the same, but while Stage is more or less a ‘player’, with limited sound editing options, Standard adds the ability to tweak instrument design and voicing, adjust virtual miking and load external impulse responses in the on-board reverb. Pro additionally lets you edit all the same stuff on a note-by-note basis (good for creatives and Cage-ophiles), mess with individual overtones, and exceed the other versions’ 48kHz max internal processing, right up to 192kHz. Studio is the same as Pro, but includes all the extra Instrument Packs. For new purchasers (of any of the versions) there’s another crucial choice to make: which soundpack you want bundled with the instrument. The choice is between a focus on acoustic pianos (which bundles the Steinway Model D and ‘K2’ grand pianos), electric pianos (Rhodes and Wurlitzer, plus the ‘Hohner Collection’), or chromatic percussions (vibes, celeste, xylophone, marimba and steel pans). 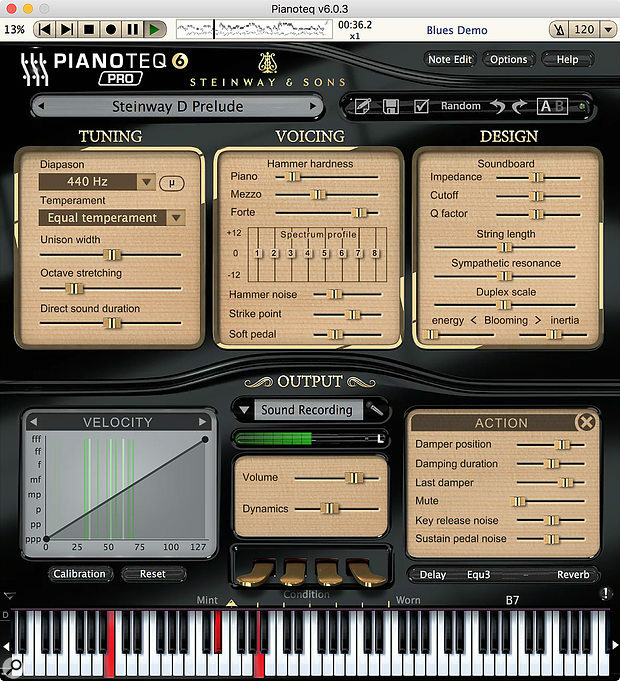 So it’s quite possible, and perfectly legitimate, to buy and use Pianoteq as a dedicated pitched percussion instrument, and not have any pianos on hand at all. 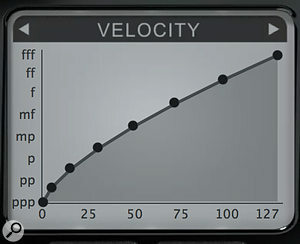 The Velocity panel lets you fine-tune Pianoteq’s response to your controller, via an editable graph or a guided Calibration routine. Setups can be saved and recalled too. 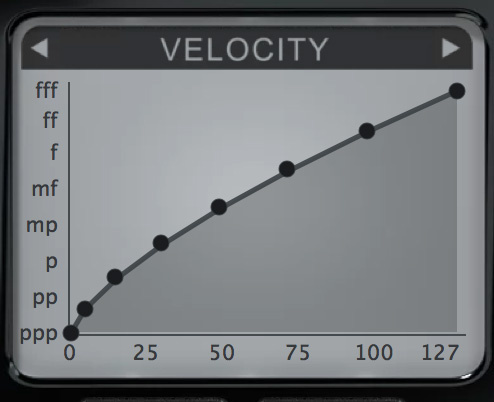 In the same panel you can also tailor note-off velocity behaviour (if your controller generates it), and continuous damper pedal response, to support half-pedalling. There’s even aftertouch response, and it’s polyphonic, but it’s only there to support the very specialist ‘bebung’ vibrato that’s possible on clavichords.Whatever starting point you choose, you can instantly download a range of free instruments: a clavichord, cimbalom, two harpsichords, seven historical grands, tubular bells, church bells, and a Yamaha CP-80. 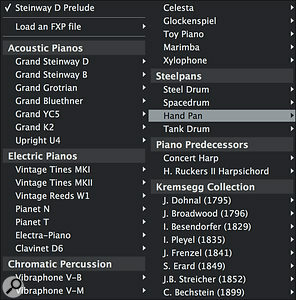 Any further expansion is via €49 add-on instrument packs, including a Steinway B, Grotrian and Blüthner grands, an upright, a ‘rock piano’, a far superior harpsichord and clutch of historical pianos, a concert harp, and any of the grands, electroacoustics or percussion instruments you didn’t choose in your starting bundle. Authorisation for all purchases is performed painlessly by an online system, with no dongles involved. To get an idea of how Pianoteq 6’s supposedly improved physical modelling differs from that of 5, I made a DAW setup in which instantaneous A/B comparisons could be made. First I saved presets from a cross-section of instruments in Pianoteq 5 (with all effects bypassed) and loaded them into an instance of 6 too. Then I recorded a range of material from my MIDI controller, duplicated it to drive the two different Pianoteq versions identically, bounced the results to audio, and started listening critically to the results. 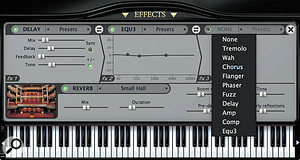 On-board EQ and effects are of really good quality: three effects slots can be filled with 10 different effect types, and supplement the always-available convolution reverb.The first thing that struck me is that, for the acoustic pianos at least, Pianoteq 6 can be audibly very different to 5. It’s a complex picture, but I’ll try to sum it up by saying that 6 generally has more weight and warmth. In comparison 5 is more nasal, middle-y, buzzy, recessed: a touch uptight. Parts of 6’s treble register sound more complex and realistic, action noise is perhaps a bit more noticeable lower down into the treble, and overall there’s much less tendency for the odd individual note to seem sterile and lifeless. All this, to my ear, was equally true for the Steinway D, B and Blüthner that I spent most time comparing. I liked Pianoteq 6 better in all cases. Electric pianos differ also: immediately visible in my DAW waveforms, but less readily noticeable to the ear. Pianoteq 5’s electrics were already top notch, and 6’s lose none of that essential quality. I could say exactly the same about the other sounds I tested, including the phenomenally good Hand Pans and Vibraphone, and some of the historical pianos. No ‘night and day’ differences, but just that sniff more refinement all round. 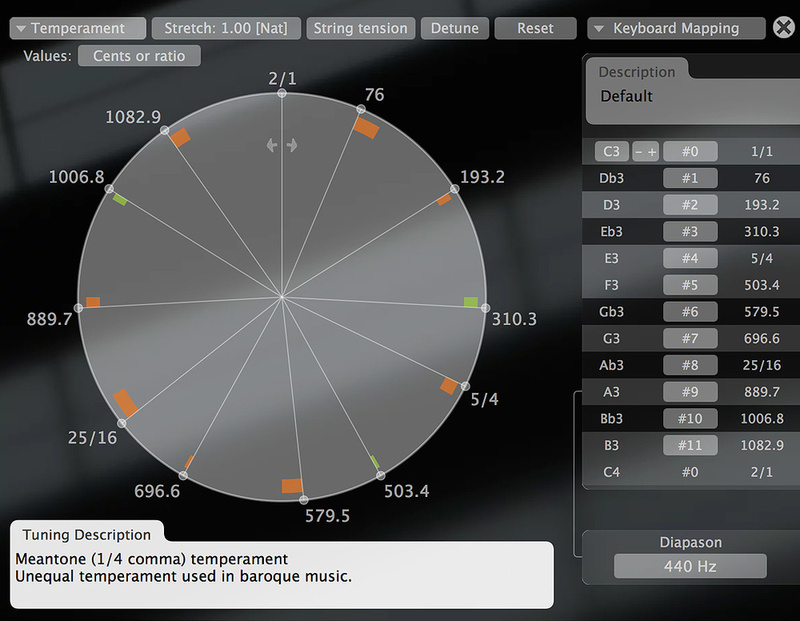 If temperaments or microtonal tunings are your thing, Pianoteq 6’s new dedicated panel will let you fill your boots.Meanwhile, Pianoteq 6’s new Advanced Tuning panel is good to have, if not immediately intuitive in use, nor well described in the manual (which is uncharacteristic for Modartt). Simple 12-note/octave temperaments are easy enough to grasp: semitone points on the ‘compass’ are draggable or programmable with numeric values (cents, ratios, deviation from equal temperament and more) in the nearby table. The whole thing is rotatable too, for when you want to transpose temperaments. But the way you’d set up from scratch something like the Wendy Carlos microtonal tunings that are offered as presets is not immediately obvious. This is very much the esoteric, ‘experts only’ end of Pianoteq though, and I don’t think a bit of operational opacity here matters much. If you’re into this stuff, you’ll grasp it. 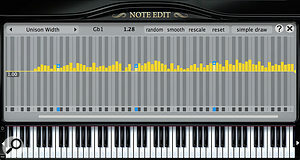 The preserve of Pianoteq’s Pro version, Note Edit lets you adjust 30 sound design parameters on an individual note basis. It’s the ultimate in virtual piano customization, and has no equivalent in the sampled world.That leaves us with the new MIDI recorder features in the stand-alone app. It’s very simple: the app is always recording. It then packages your discrete musical utterances into separate MIDI files that can be recalled, replayed and/or exported via a pop-up menu. Very handy! Don’t expect them to be immediately useful in a DAW, though, unless you were playing along to the stand-alone’s built-in metronome. When all-round quality and potential for expansion are taken into account, there’s not another modelled piano to touch Pianoteq. Recent sample-based pianos from Synthogy, Garritan and co are right up there in sound and playability, and some users may prefer the notional ‘authority’ of the sampled approach, but you pay the price in installation size, for one thing. An enhanced modelling scheme gives a boost to all 49 currently available Pianoteq instruments. Not just for acoustic pianos — great electric pianos and pitched percussion too. Huge sound design potential that leaves sampled-based pianos for dead. Co-exists nicely with earlier versions, in case you’re reliant on an ‘unimproved’ sound. Costly to max out with all instrument pack add-ons, unless you choose the special-price Studio bundle at the outset. Everything you already knew and loved about Pianoteq, but better! A musically rewarding, highly configurable instrument for all kinds of hammered, plucked and mallet-struck instruments, which takes up less room on your hard drive than a word processor. Pianoteq 6 Stage €99, Standard €249, Pro €399, Studio €699. Prices include VAT. Pianoteq 6 Stage €99, Standard €249, Pro €399, Studio €699.